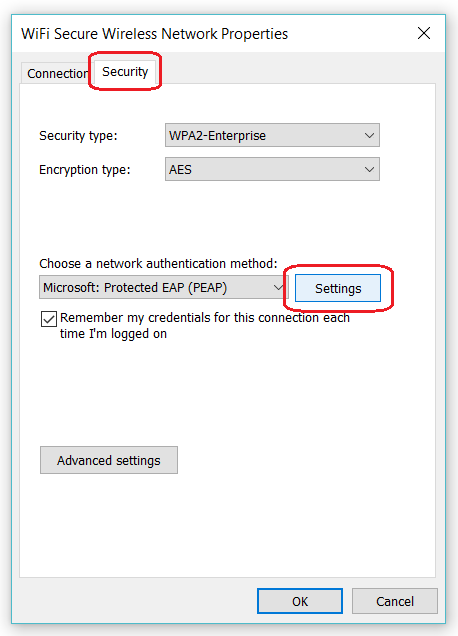 When using Wi-Fi Secure on a Windows Operating System that is older than Windows 10, further configuration is needed before you can connect successfully. The config file (available here) should be downloaded and run according to the instructions outlined here (or, for your members, a guide is available in our Member Knowledge Base). If, however, you are unable to run this file due to security restrictions on your device, it is possible to do the configuration manually by following the steps below. These steps demonstrate how to do the manual configuration on Windows 7 and 8. First, ensure that any instance of Wi-Fi Secure remaining on your device is forgotten. 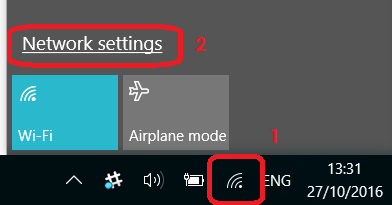 Click on your network icon in the bottom right corner of your taskbar, this opens your Wi-Fi menu. Windows 8 and 10 users can also reach Network Settings via the PC settings found in your start menu, or through a search of your programs. Click on Manage Known Networks. Find Wi-Fi Secure in this list. Click on it, and select 'Forget'. Right click on the network icon in the bottom right corner of your taskbar, and click on Network and Sharing Center. In the new window, click Manage Wireless Networks. Find WiFi Secure in this list, click on it, then select Remove in the toolbar at the top of the list. Right click on the network icon in the bottom right corner of your taskbar, and open the Network and Sharing Center. 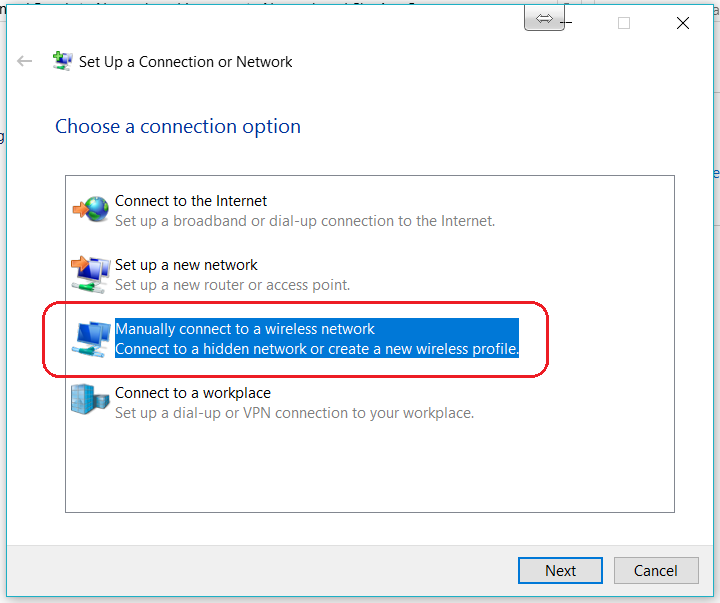 Select Manually connect to a wireless network, then click Next. Click Next, then click Change Connection Settings. In this new window, click on the Security tab, and then the Settings button as shown. 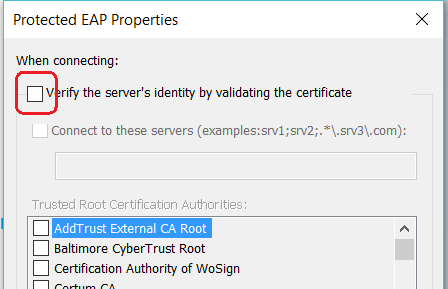 In the new window, uncheck the box Verify the servers identity, as shown, then select OK.
Now, select Advanced Settings found at the bottom of the previous window. In the new window, check the box Specify authentication mode, then select User Authentication, then click Save Credentials, as shown. In this pop-up window, enter your WiFi Secure username and password, usually found in an email from Connect. This password can be reset in Wi-Fi Manager if necessary. Once done, click OK to close all the windows. WiFi Secure should now be set up successfully. If not already connected, go to your Wi-Fi menu and select 'WiFi Secure' to connect. Your PC will use the credentials that we have just manually saved. This setup will remain until manually forgotten (as we did at the start of this tutorial).